Working with textiles, as I have done for the past fifteen years, is often a passport to genuine experiences and interactions with rural artisans. Each time I visit an artisan village on ‘work’ I leave feeling truly blessed to be able to overcome language barriers, by communicating through the language of textiles – its warp and weft – a mutual understanding of the craft of weaving. I was trained as a weaver in Scotland, where I also grew up. I moved to Bangalore in 2005, and my relationship with Indian textiles and traditional artisans grew with each year I spent there. 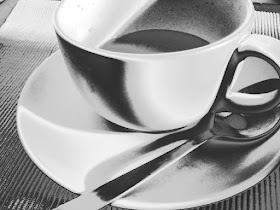 With such a rich textile heritage, it is easy to develop many textile obsessions, but there is one fabric that captured my attention from the moment I came across it. Eri silk. The soft handle, the rustic and slubby texture of the yarn, the matt sheen of this unusual silk, the weight and drape of the cloth and the subtle shades of natural dyes drew me in and found a place in my mind. I was fascinated by the fabric and the place where it was produced - North East India. When people talk of textiles of North East India, it is rarely textiles of Meghalaya that will be first brought into the conversation. Bold tribal textiles of Nagaland, Eri and Muga silk with figurative motifs of tribal Assam are well established on the textile map. 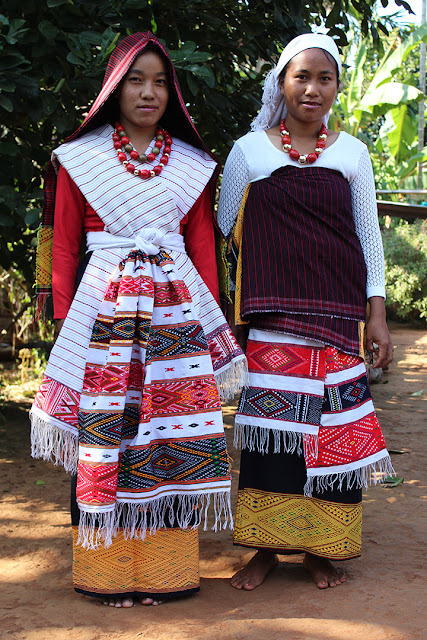 Some may know of the fine and compact Phanek embroidery and the Wangkhei Phee textiles of Manipur (using the same technique of jamdani from West Bengal and Bangladesh), while textiles from Meghalaya are barely given a mention. 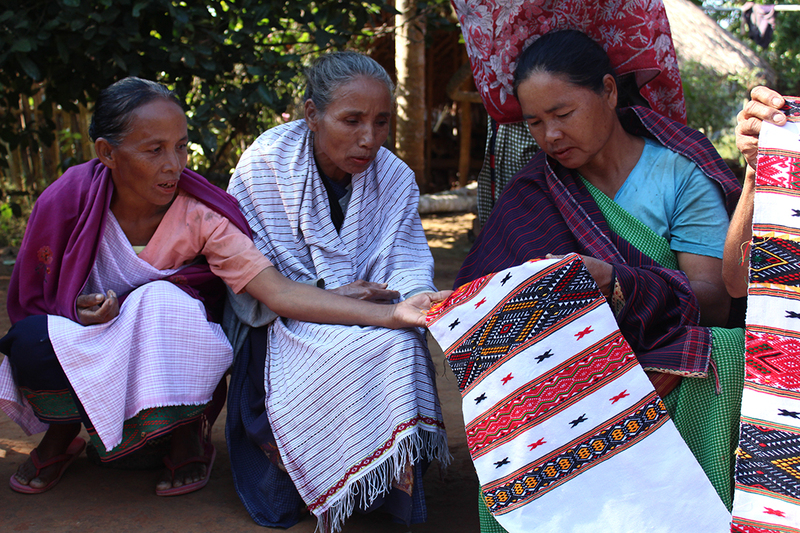 What a treat for me then, to be invited into the villages on a textile consultancy with NESFAS, a Shillong-based NGO, to assess the potential and production constraints of the Eri silk weavers, spinners and dyers and work with them to expand their markets. 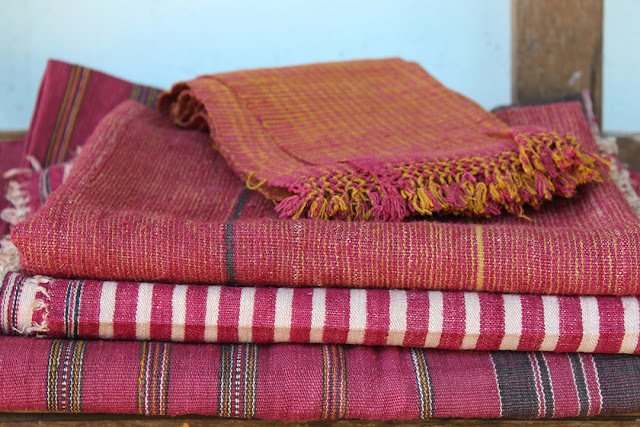 I found that while Meghalaya is a state more or less off the well-trodden textile trails of India it has a rich, sincere and humble textile history. As a Scottish weaver I have received a very warm welcome in Meghalaya. Each person I meet reminds me that Meghalaya was affectionately named ‘Scotland of the East’ by the British. I (try to) respond with equal enthusiasm every time as I talk of the similarities with Scotland; the rolling hills, the deep gorges, pine forests and clean fresh rivers. 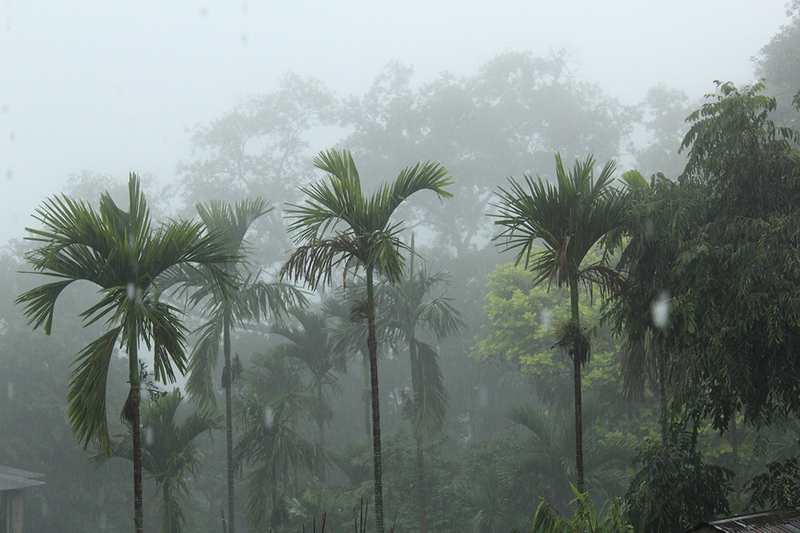 To talk of Meghalaya or equally of Scotland and not to mention the rain is impossible. Rain shapes a land, gives life, fertility and endless shades of the colour green. I have always found an affinity with people who come from rainy places and Meghalaya is no exception - though the rain here is on a completely different scale to my homeland. Officially known as ‘the rainiest place on the planet’ the people have come to accept and understand how to live with the rain, enjoying the dynamic seasons, never leaving the house without an umbrella. 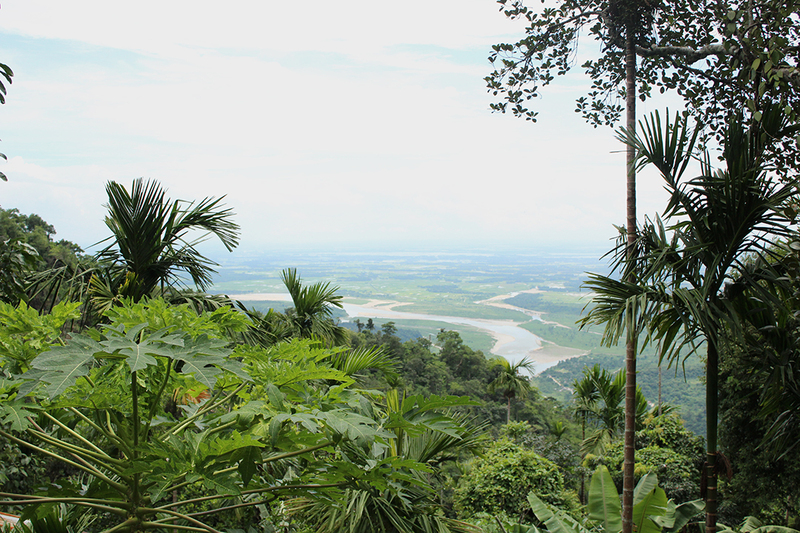 One particularly poignant moment for me was in Mustoh, a village in the hills bordering Bangladesh. Looking down on the flooding Bangladeshi plains while being pummelled with torrential rain (over several days) gave me real experience of the forces of nature that impact the lives of so many people. 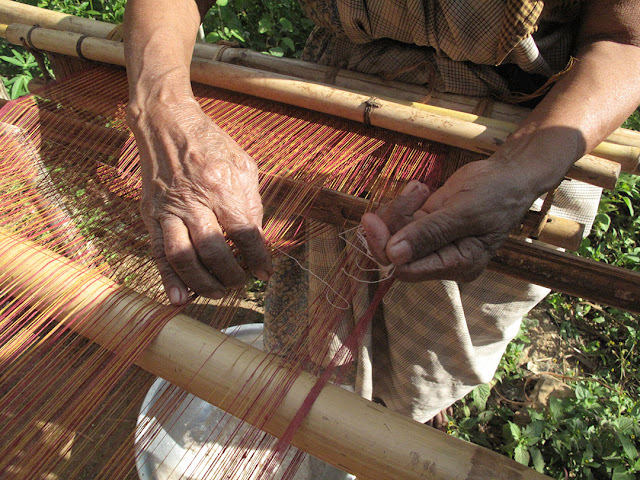 But back to the weavers, and the indigenous craft culture of Meghalaya. While Eri silk is best known for its production in Assam, it also has a long history with the people of Meghalaya. 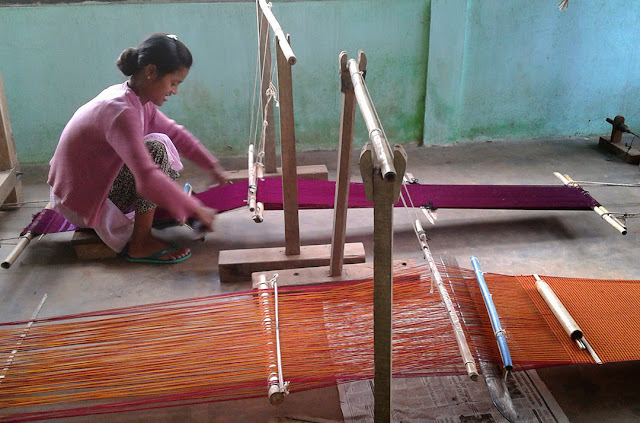 The main hub of Eri silk weaving in Meghalaya is the Ri Bhoi District, an area on the border of Assam, halfway between Guwahati and Shillong. It is a lush, fertile area where literally anything will take root and flourish. 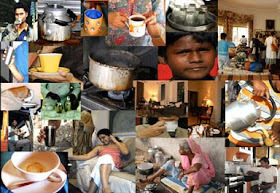 The self-sufficient and naturally sustainable communities of Ri Bhoj are primarily agriculture based, their main produce being innumerable varieties of rice, ginger, turmeric, and a range of delicious seasonal vegetables such as pumpkin, spinach, radish, squash, brinjal, tree tomato, beans and many more. In most villages farming responsibilities come first, with the whole village working on planting and harvesting of rice. 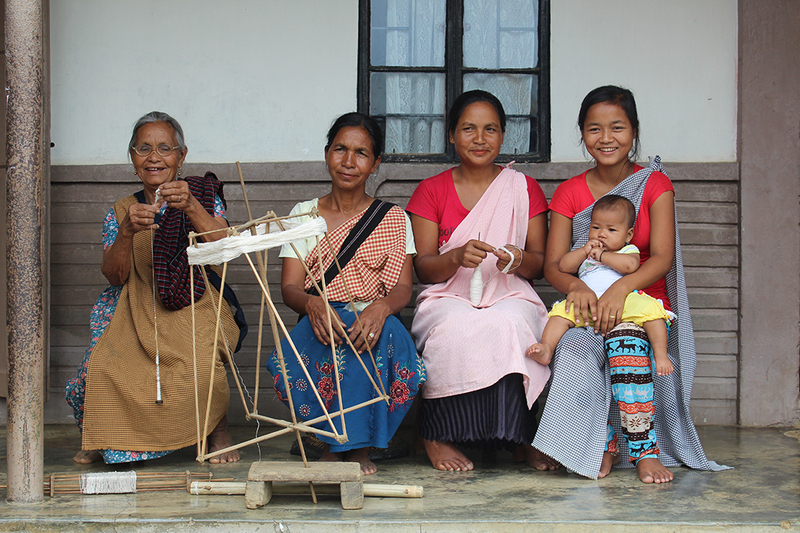 Traditionally weaving activities are integrated into village life in the moments when agriculture is less demanding. When women get together in the community it is not rare to see them spinning eri silk with the takli or drop spindle, as they share anecdotes from their family life. Understanding the relationship between Eri silk production and the rhythm of the agricultural seasons is the first step towards understanding the weaving communities in the Ri Bhoi District. Eri silk in Meghalaya has always been cultivated domestically, and still is today. The silk worms feed on the leaves of a number of plants, most commonly the castor plant, and grow fat and green in the shelter of the rearing house - generally a purpose built bamboo shed in the compound of the home. 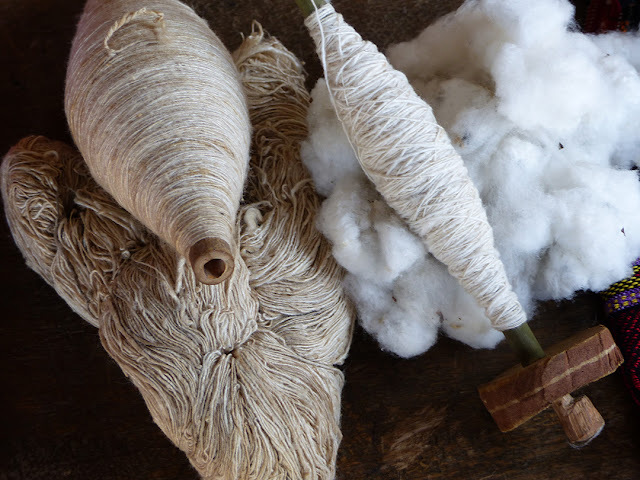 For those of you reading this blog post who do not know about Eri silk, it is also known as ‘ahimsa silk’, ‘peace silk’ or ‘non-violent silk’ due to the non-violent method of extracting the silk from the cocoon. The cocoon is spun of short fibres, making it impossible to reel the silk from the cocoon. The majority of the world’s silk is reeled, whereby the cocoon is boiled with the worm still inside to loosen the silk filament before reeling. 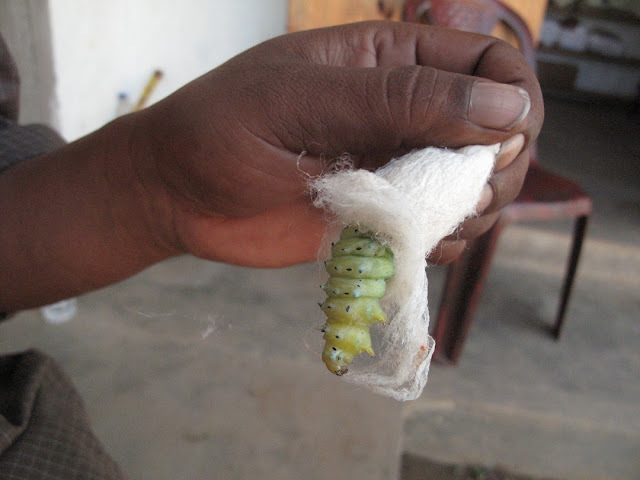 The Eri silk worm however is either taken out by breaking open the cocoon, or the worm is allowed to eat its way out through the cocoon to emerge as a moth and continue the cycle. As Eri silk is hand-spun, it is of no matter that the cocoon has been broken open, thus saving the worm of being boiled alive. The amusing irony that I have observed with this reference for Eri silk (‘ahimsa silk’), is that once out of the cocoon the majority of the worms will be served up for dinner or turned into pickle! 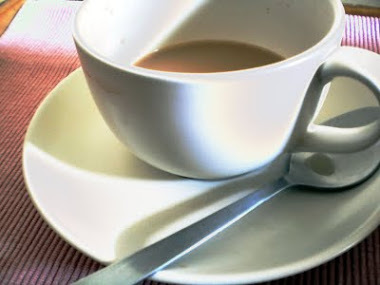 Ultimately the worm is not harmed in production of the silk, but being a great source of protein, it is not wasted. 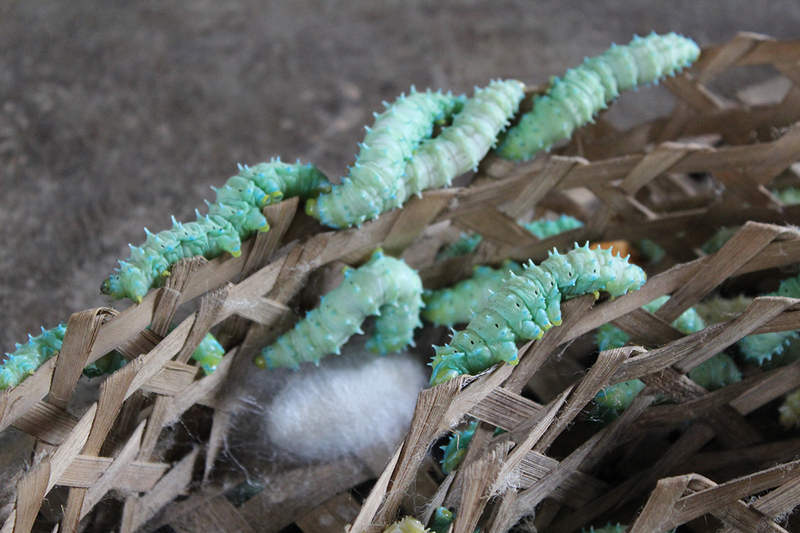 You can often see large bamboo trays of these worms being sold in the market, and in fact they can fetch as high a price as the silk cocoon itself. 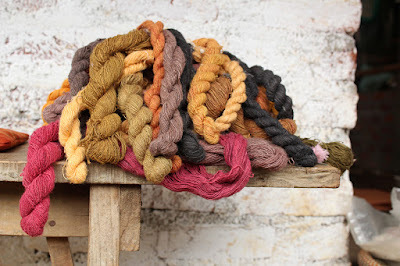 Cocoons are washed, hand-spun and the yarn is dyed with natural dyes. 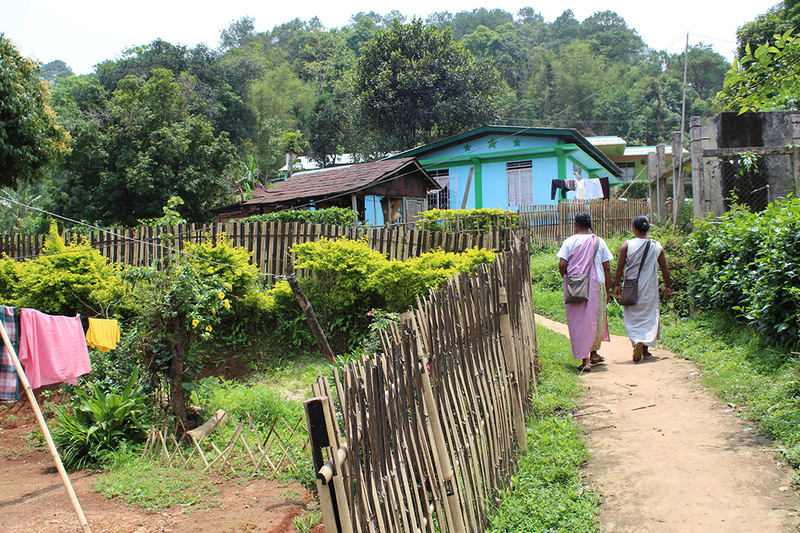 Traditionally the colours used in Meghalaya were stick lac red, turmeric yellow and black from iron ore. Today, with training and support from government and NGO’s, the artisans have greatly increased their repertoire of colours, experimenting with all kinds of leaves, flowers, roots and fruits in and around the forests. Amongst many other plants, they are now experimenting with hibiscus (china rose), ananto fruit, marigold flowers, guava leaves and teak leaves. The colours they create depend on the season, the availability of these wild natural resources and even how old the plant is. Eri silk from Meghalaya is a tangible reflection of the rural communities it is produced in. The quality of the silk depends on the quality of the leaves the worm feeds on, the texture of the thread is dictated by the hand of the spinner, the natural dyes come from the wild produce of the land, and finally the weaver working with a floor loom made of local bamboo brings her own creativity to the design and construction of the cloth. 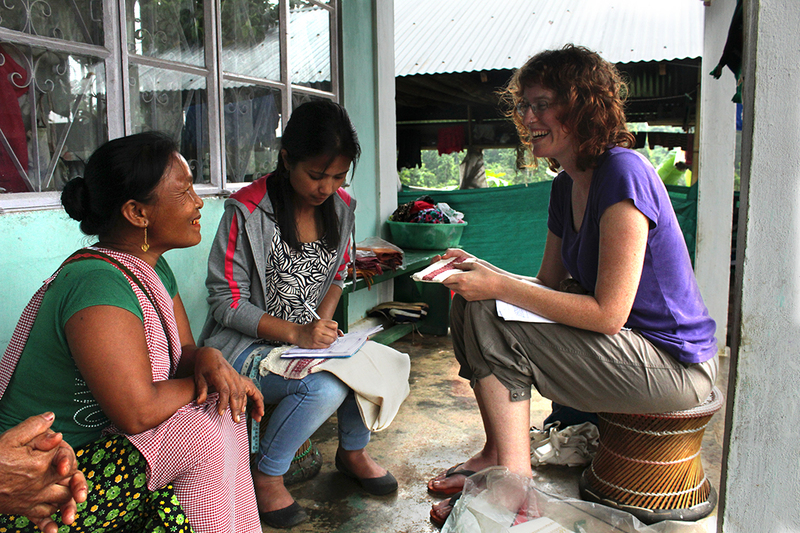 My current work in Meghalaya is research for my doctoral studies, through the Centre for Sustainable Fashion, University of the Arts London. I have been undertaking an ethnographic documentation of the socio-cultural context of Eri silk production in the Ri Bhoi District, and a technical analysis of the weaving process, recording their skills as new technology is introduced to their current practices. I have spent much time staying with the weavers, observing their rhythm of working, delving into their tribal history, and studying the textiles in their family collections. I am happy to say that there is a deep and meaningful history of Eri silk textiles in Meghalaya, closely linked to the social history of the communities. I have found sophisticated supplementary weft designs that were woven on simple floor looms. These textiles were once used by traditional dancers as a waistband with long sashes. With the widespread conversion to Christianity many of the traditional celebrations died out, and with it the need for dancers, or indeed their stunning waistbands! These skills are not lost however, and I have found contemporary versions in acrylic or cotton being woven in some villages. On the trail of the supplementary weft technique I have come across interesting indications of tribal assimilation reflected in the textiles. 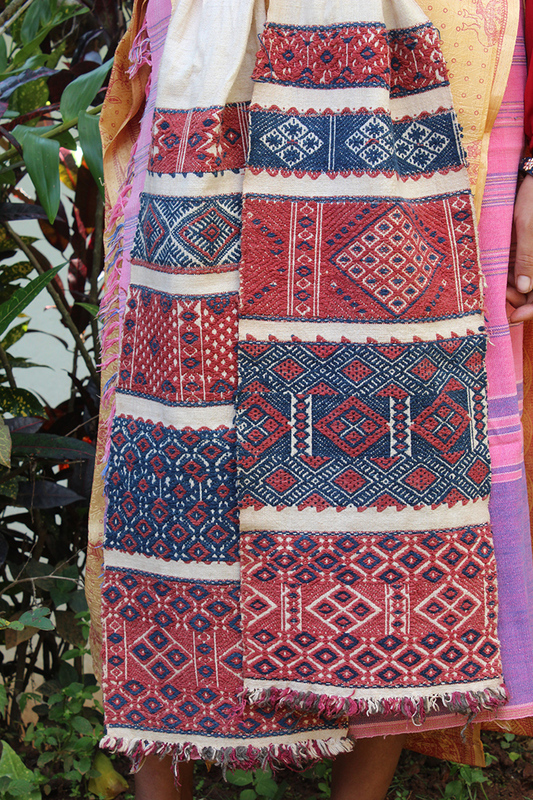 The Assamese and the Karbi textiles are woven with highly figurative motifs of flowers or mythical animals, which are also found in the Ri Bhoi district. The Khasi Bhoi people have very clear geometric patterns, yet use the same technique of supplementary weft. Khasis elsewhere in Meghalaya do not use this technique, nor do they have the intricate ‘dancers waistband’ in their traditional dress, indicating that the close interaction between the Karbi and the Khasi people of the Ri Bhoi District may have led to exchange of ideas and techniques in textiles. When one delves into the tribal history of the area it becomes clear that this is really a rich land of many layers. 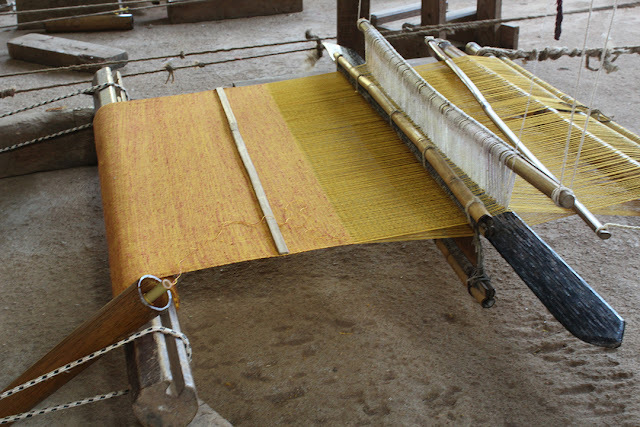 In some villages there is a noticeable shift in the approach to weaving. In Umden, the ‘model village’ of eri silk production, weaving has become a thriving commercial business. Weavers work full time and some do not work in the field at all. Many are structuring their workshops to be able to accommodate larger orders. The frame loom, and fly shuttle loom is now widely used, millspun yarn is available which they use in the warp, and you can see far more experimentation in design moving away from the traditional textiles. My own interest in textiles has led me into deep discussions on tribal culture, the matrilineal system of the Khasis and role of women in Meghalaya, community systems of authority, the relationship with colonial settlers, the mass conversions to Christianity, the list goes on. What began as a search for indigenous textiles has opened-up doors to explore a rich cultural tapestry, building lasting friendships with people from such different backgrounds. 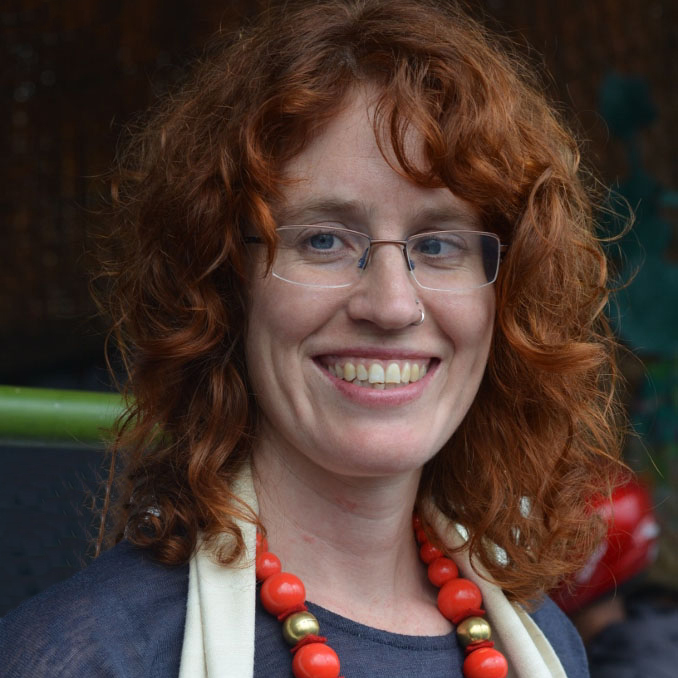 Anna-Louise Meynell is a designer of woven textiles from Scotland who has been living and working in Asia for 12 years. Her consultancy work in handwoven textiles takes her to inspiring communities in India, Laos, Cambodia and Myanmar. With so much travel and textiles in her life she describes herself as a ‘nomadic weaver’! Anna-Louise has been working in Meghalaya since 2014, and is currently based in Shillong, doing research on the traditional Eri silk textiles of Meghalaya. The North East of India has captured Anna-Louise’s heart, mind and textile imagination and she may well be there some time longer! 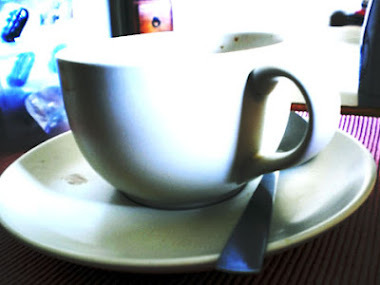 What a wonderful morning read. Took to me to another world into this quaint beauty. The humble floor handloom moistened my eyes. Funny how the woven waistbands look similar to an ajrak print. I hope Anna writes a book soon. What a treasure trove of experience. So glad u asked her to write a blog here. I'm now following her on Insta. thanks for reading Sahar, and for leaving this comment - every writer's delight to have a reader like you. Thanks for your comment Sahar, it is great to receive such encouraging feedback! The North East is an incredible place full of inspiration, there is so much more to explore.